Great athletes have always shown amazing character to overcome the daunting challenges and competitiveness of fellow competitors, to etch their names in history books. Success is sweeter than honey, when they overcome their final bout with their own willpower. 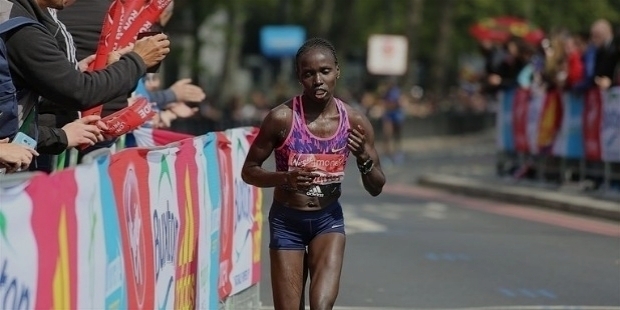 Kenya’s Vivian Cheruiyot, popularly known as ‘Pocket Rocket’ for her diminutive 1.59m-height and speed, paced her run with such confidence that Mary Keitany’s attempt to break Paula Radcliff’s record did not bother her at all. 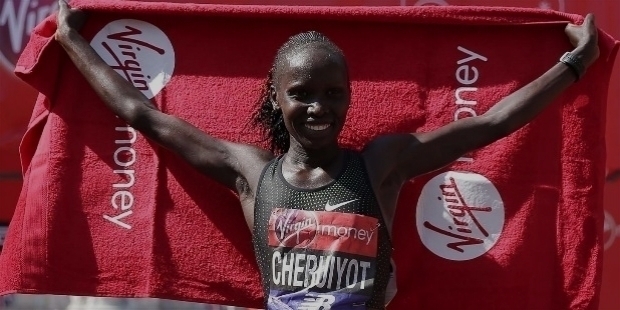 While Keitany was leading the race early on, matching stride for stride with two male pacemakers and Dibaba on her heals, Cheruiyot kept her momentum and energy saved for the final assault, to win the Women’s 2018 London Marathon. 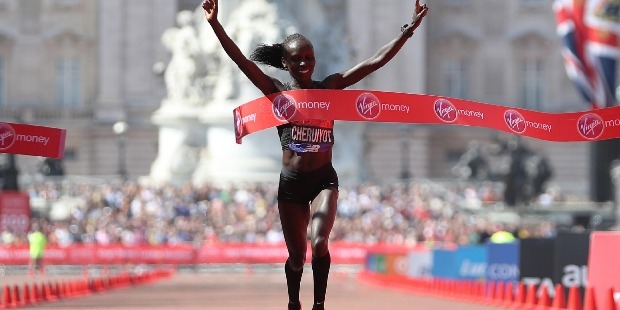 She won her first London Marathon title in her second attempt, clocking 2:18:31. The confident Cheruiyot enthused, “I did not want to race against anybody. I wanted to race alone. So, I raced like that. The reason, it was so good for me today, because I started slowly. I did not go with the faster group, because the faster group was quicker than I was at the start. 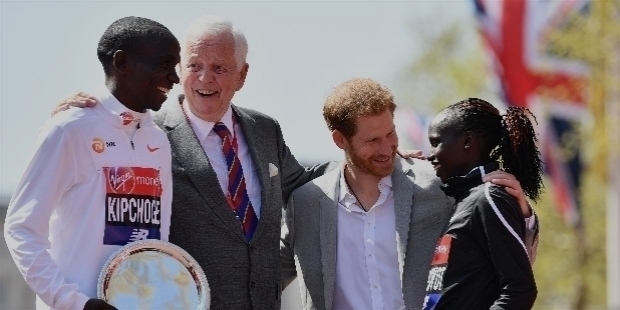 The 2018 edition of London Marathon was all about Kenya’s Mary Keitany and Ethiopian Tirunesh Dibaba’s attempt to break Britain’s Paula Radcliff’s ‘mixed-gender race’ Marathon Record of 2:15:25, set in 2003. Assisted by two male pacemakers, Keitany led the course for maximum period. The pacemakers constantly maintained their pace to break Radcliff’s record. At the 10-mile mark, Keitany was 32 second ahead of Radcliff’s 10-mile time. Dibaba was on her heals, followed behind by Cheruiyot. Leading from the front, Keitany was in control before she pulled slightly ahead of Dibaba at nine and a half miles. Both the athletes were half a minute quicker than Radcliffe’s time. The hot conditions and the pacemakers’ blistering pace finally took a toll on Dibaba and Keitany at the 30km-mark. First, it was Dibaba, who struggled to continue the race. She started walking, running, walking and finally gave up the race because of her severe conditions. The Pocket Rocket gained over her lost ground steadily. Around the 21-miles mark, she passed Keitany, who was fading fast by running the race at breakneck pace, in order to break Radcliff’s record. Cheruiyot grew stronger with the finishing line getting nearer. She was smart enough to judge and run the race as planned. Vivian Cheruiyot approached the finishing line, waving at cheering crowds with her infectious smile. Hands raised, she crossed the line with her personal best 2:18:31. Kenya's Brigid Kosgei finished 2nd, clocking 2:20:13. Ethiopian Tadelech Bekele finished 3rd, clocking 2:21:30. It was ironical and sad to see Keitany’s condition as she neared the finishing line. She struggled hard to overcome fatigue and over exhaustion to finish 5th, with a time of 2:24:27. 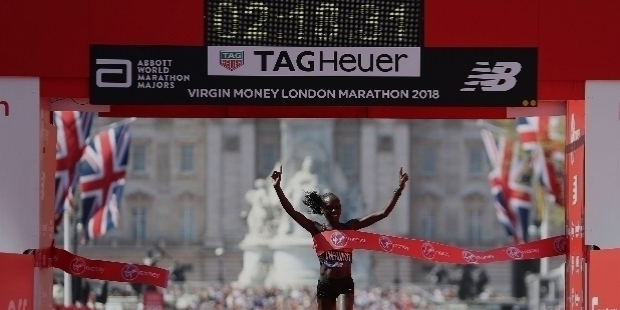 Cheruiyot, who had won her career-first Marathon in Frankfurt last October, won the 2018 London Marathon in her second attempt. She had finished 4th in her Marathon debut at the 2017 London Marathon. The 5,000m Olympic Champion Cheruiyot, now, has two Marathon Gold medals in her first year of Marathon running. Vivian Jepkemoi Cheruiyot was born near Keiyo in the Rift Valley Province, on the 11th September 1983 in Kenya. A gifted talent, Vivian won her first Silver medal at the 1999 IAAF World Cross Country Championships in the ‘Junior’s Category’, when she was just 15. The teen won the Bronze medal in 3,000 metres at the 1999 World Youth Championships in Athletics. This was just the beginning of Vivian’s rise in the international level. For the 1999 All-Africa Games in Johannesburg, South Africa, Vivian earned a senior call-up. She stood third in the 5,000 metres. At the 2000 IAAF Cross Country Championships, Vivian was declared the Junior Champion. At the age of 17, Vivian was selected to represent Kenya at the Sydney 2000 Olympics in 5,000 metres. 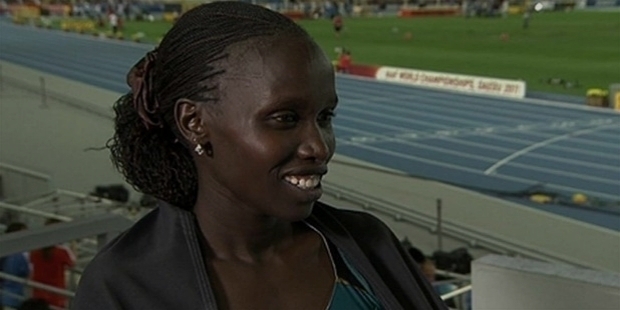 Vivian made it to the 5,000m final, by setting her personal bests in the qualifying rounds. Her inexperience among stalwarts and seasoned athletes, Vivian finished last. Vivian Cheruiyot trained harder under Coach Ricky Simms at the PACE Sports Management. At the 2007 World Championships in Athletics in Osaka, Japan – Vivian clocked 14:58.50 to earn the Silver medal, behind Meseret Defar’s 14:57:91. Vivian was becoming a threat for other African runners in the 3,000 and 5,000 metres. She was improving tremendously at a faster pace, as compared to other athletes. Vivian clocked 8:30.53 to break the Kenyan 3,000m Indoor Record in Birmingham, in 2009. She was becoming more confident and seasoned, running her races to win, among stiff competitions. Vivian won the World’s Best 10K race in Puerto Rico, followed by another win at the Great Manchester Run 10K race. In the year 2009, the Pocket Rocket was always seen on the ‘Victory Podium’ in illustrious races. At the 2009 IAAF World Championships in Athletics in Berlin, she won the women’s 5,000 m Gold, clocking 14:58.33 to conquer fellow countrywoman Sylvia Kibet. At the 2009 World Athletics Final, Vivian went onto win the Silver and Bronze medals in 3,000 and 5,000 m respectively. She stamped her authority by winning the 2009 New Year’s Eve San Silvestre Vallecana race. In 2010, Vivian defended her World’s Best 10K title. She picked up the Silver medal behind Meseret Defar in 3,000 m at the 2010 IAAF World Indoor Championships. She avenged her defeat at the 2010 African Championships in Athletics in Nairobi. She conquered Defar in the 5,000 m, to win the African Title. 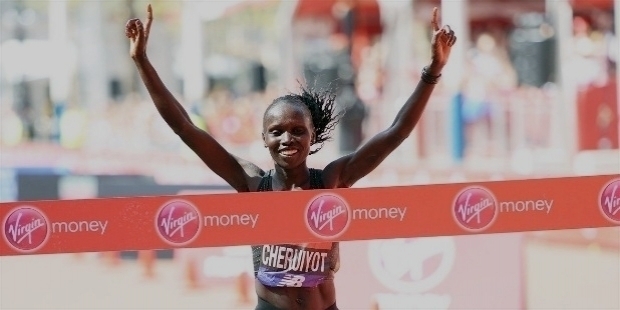 Vivian Cheruiyot’s main focus was on the 2010 IAAF Diamond League. The 2010 IAAF Diamond League was the first edition of the Diamond League, an annual series of fourteen one-day track and field meetings. The series began on the 14th of May in Doha, Qatar and ended on the 27th of August in Brussels, Belgium. In the 5,000 m, out of 7 outings, Cheruiyot triumphed over Ethiopian Tirunesh Dibaba and Sentayehu Ejigu in 3 races, to lift the ‘Overall Champion Trophy’. Dibaba and Ejigu, both won 2 races each. 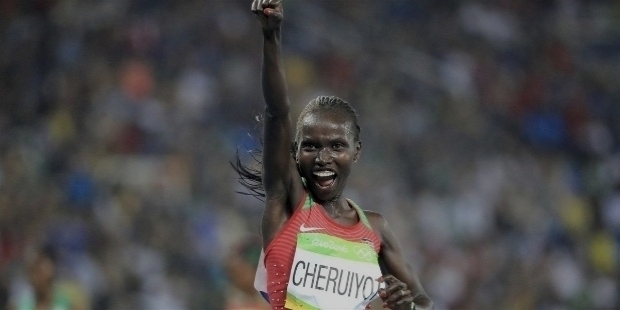 At the 2010 IAAF Continental Cup, Cheruiyot once again defeated Ejigu in 5,000 m to win the Gold medal for Africa. 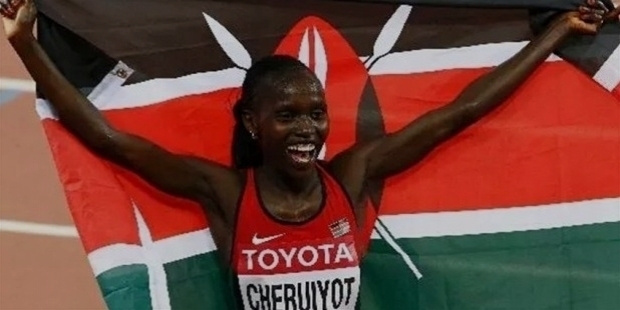 2010 was Cheruiyot’s year of Gold. She picked up the 5,000 m Gold at the 2010 Commonwealth Games in New Delhi. In 2011, Vivian concentrated for Cross Country Races. She was determined to win a medal on the world stage. At the 2011 IAAF World Cross Country Championships in Punta Umbría, Spain, Vivian won the individual Gold, as well as, Gold for Team Kenya. The Pocket Rocket defeated her compatriot and rival Linet Masai, clocking 24:58 for the 8-km distance.2012 arrived and Vivian registered her stamp at the World’s Best 10K with the Gold medal, clocking her best 30:47 in road races. She won the Gold in 3,000 m at the 2012 Diamond League circuit in Doha and 5,000 m in Rome. At the 2012 London Olympics, Vivian won the Silver medal in 5,000 m and took the Bronze medal in 10,000 m.
Vivian Cheruiyot was conferred with the Laureus World Sports Award for Sportswoman of the Year 2012, for her remarkable achievements throughout the year. The prestigious award is presented to the most remarkable women from the world of sports, along with the greatest achievements fans have admired, throughout the year." The year 2013 saw Vivian giving birth to her first son Allan Kiprono. While she was nursing her baby, she knew she had to resume training for the World Athletics Championships. True to her title as the Pocket Rocket, Vivian started training on the slopes of Elgeyo Escarpment after couple of months, post delivery. Her passion and dedication is an inspiration for many younger athletes in Kenya and around the world. On August 24, 2015, less than two years after giving birth, Cheruiyot walked on the victory podium in Beijing, China, to receive the International Association of Athletics Federations (IAAF) World Athletics Championships 10,000m gold medal. Her grit determination, dedication towards athletics, hard training regime, sacrifices, passion and love for winning medals for her nation is indeed remarkable and superlative. A year later, at the 2016 Rio Olympics, the Pocket Rocket ran a superb 5,000m women’s final with a new Olympic Record 14:26.17, to win the Gold medal. 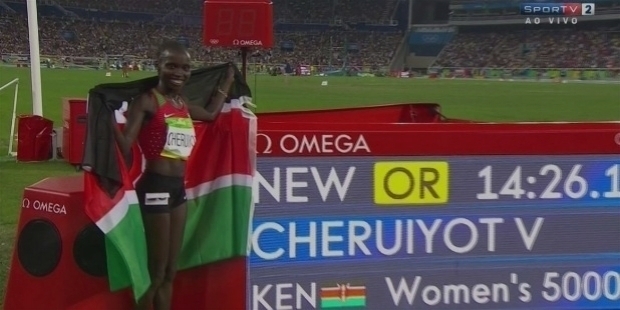 She went onto win the Silver medal for Kenya in the 10,000 m, with a new National Record clocking 29:32.53.